Your All Holiness and Beatitude, Patriarch of Constantinople – the New Rome, and Ecumenical Patriarch, Most Beloved Brother in Christ our God and our Concelebrant, Kyrios Kyrios Bartholomew. We embrace you with joy and address your All Holiness with brotherly love, together with the Metropolitans, Bishops and the respectful clergy and the people. I come to you today from Antioch where the followers of our Lord were first called Christians; from Antioch which gathered under her wings men whose faith and stature were acknowledged by all Christians; from Antioch in which the chiefs of the apostles, Peter and Paul, preached, together with St. Ignatius of Antioch, the martyr who enriched the universal Church with his theology rooted in the Gospel of St. John; from Antioch where St. John Chrysostom started his mission and carried a spiritual heritage to Constantinople where some of his relics were brought back to this Church after they were taken away by the Franks; from Antioch in which flourished St. Ephrem and St. Isaac the Syrian who Christianised Syrian thought and left to the world the best of what could be written in spirituality and asceticism. We should also not forget the contribution of St. Maximus the Confessor, who originated from the Golan Heights in the vicinity of Damascus and who became a doctor for the world and defended in his person the Orthodox faith against all sees and authorities. His witness was exactly like that of St. John of Damascus before him, who left us, besides his outstanding theological works, beautiful hymns which adorn the services and the celebrations of the liturgical year and elevate those who celebrate the feast of feasts in all Orthodox countries and empower us to stand firm in the joy of the glorious resurrection which we are still experiencing to this day. Many ancient and modern martyrs, monks and commentators contributed, throughout the ages, to the formation of this Antiochian pattern of thought, enriching the whole of Christianity by what has been given to us through the revelation of the Holy Spirit. I should also mention here those men of Antioch who sat on the throne of Constantinople, such as Nectarius of Tarsus (381 – 397), Arsacius (404 – 405), John Third Scholasticus (565 – 577) and Cosmas the Antiochian (1075 – 1081). This is a sign of the brotherhood between our Churches from ancient times, the marriage of our cultures and the close relations which continue to bind the thrones of Constantinople and Antioch. As I recall the Antiochian contribution to the life of the universal Church, I assure your Holiness that, despite the enormous difficulties and the troubles we are going through, we shall remain faithful to the mission of those great fathers; and we shall revere and revive their memory and heritage, which were incarnated all over the Antiochian territory, in Syria, Mesopotamia, Arabia and all the East. 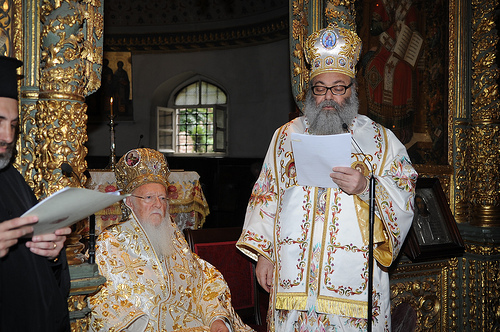 In addition to this theological and spiritual radiance, the Antiochian See has consistently played a mediating role and called for unity and peace within the Orthodox family, seeking always to soften positions and working continuously to promote reconciliation in the spirit of the Gospel of our Lord Jesus Christ. Mention should be made here of the role that our predecessor, Patriarch Peter the Third, played at the beginning of the eleventh century when he reminded us of the necessity of forgiveness and laying aside unnecessary accusations and of accepting the other in love so as to win him to the Orthodox faith. He said to the Patriarch of Constantinople, Carolarius: “I throw myself at your feet … and beseech you not to ask for everything, lest we lose everything … Human beings must not hate any of what God has created; they should instead accept it with thankfulness”. We come to you today accompanied by all these saints in order to affirm to you the great position of your Apostolic See in the hearts of Antiochians. We express to you our deep appreciation of what you have done in the difficult times of the history of our Church when you received its patriarchs and provided them with support when they needed it. We come today to affirm that we look to your Apostolic See as an Orthodox point of reference carrying the responsibility of preserving the unity and harmony between sister Churches, encouraging them to respect the holy canons when they deal with one another and with others. There is a great need today for someone who can play this role, going beyond all racist, political, national and partisan considerations, and going beyond all wounds, so that the witness of the Orthodox Church to Our Lord can be strengthened. Help us, Your Holiness, to be ready to go forward with the free brotherly love which does not judge, so as to transcend those “secondary” disputes and disagreements which have at times in the past tarnished and still today tarnish relations between our Churches. We come to you, Holy brother, in our first visit after our enthronement as Patriarch of Antioch and all the East, hoping that we can continue in these tragic circumstances which you know well our visits to the other heads of the sister Churches in order to convey to each of them a message of faith and brotherhood similar to that which we are conveying to you now, and to discuss with them common concerns, inspired not by the spirit of this age, but by the spirit of the Gospel, putting our sights on what the Lord has told us:- “the one who wishes to be first among you shall be servant to all.” (Mark 10:44). Our Orthodox Churches have so many tasks to accomplish in order to be able to witness for the truth of our mission. I shall mention here only the most important of these tasks. We have put you in the picture from the very first moment concerning the disagreement that the See of Jerusalem caused when that See appointed a Metropolitan in Qatar and claimed, in clear and obvious opposition to canon laws and history, that the Gulf region pertaining to our Antiochian See in which we have a working diocese and a number of active parishes for several decades, is part of his jurisdiction. We will not resort to the non-brotherly measures to which that See has resorted with other Churches when it faced similar cases. We insist, however, on our right, and expect from your Holiness some work to fix this matter as soon as possible. We would also like to talk about the preparatory work for the pan-Orthodox Synod in order to express our concerns regarding the direction this work has taken, in opposition to the universal vision of Patriarch Athenagoras when he originated the idea of holding this Synod. The Patriarch had hoped that the Synod would not be limited to discussing our relations with the non-Orthodox and non-Christians and the world, and to issues related to positions and authority in the Church. These last issues alone could give the impression that the spirit of the world prevails in our relations, when what the world expects from the Orthodox Church is a prophetic word which would give meaning to its existence, the meaning that the world has lost by departing from the Orthodox path. Thus it is essential to seek to expand the agenda of the Synod in order to touch upon the challenges which face all people, both young and old, so that the synod might become a general Church event that could be of interest to everyone, Orthodox and non-Orthodox alike. We still have plenty of time to open up these issues. This Synod, should it be held, has to affirm, among other things, the centrality of the human person and the centrality of communion among all human beings. Such an affirmation must be accompanied by the necessity of acknowledging the gifts already present among the people of God, as we work on improving interaction and respect for each other in order to avoid slipping into the abyss of institutionalism. Only then will the leadership of the Church and the people of God complement each other and exchange gifts in the service of the Truth. It is that Truth which alone liberates, making us witnesses to the resurrection, truly raising us up, to the Spirit who revives us, and to the Trinity, the Source of love and life itself. Accordingly, we should observe and confess humbly that the division between the theology of the Church and its sociological reality is unfortunately increasing. We must prepare ourselves to utter courageous and inspiring words so that we can revive what has become antiquated in our practices and actions. In order to crystallise these ideas, we confirm to your brotherhood the importance of calling regular meetings of the heads of the Orthodox Churches, with their assistants and counsellors, in order to discuss those matters that impede Orthodox witness. It is right that we should work together to find ways to promote and harmonise relations between the Orthodox Churches. Therefore, it is necessary to expand the agenda of the imminent Synod and prepare ourselves so that each of us can, contribute to removing the divisions between the churches and to address the challenges facing us. It is expected that these meetings will look at the diseases of Orthodoxy today. The first of these is the increase of racist thought and the sad confusion between Orthodoxy and nationalism. There is no need to say that, at times, it seems to us that some would hold to their race or nation more than to their Orthodoxy. This impedes the witness of our one Orthodox Church, and makes it look divided and heterogeneous. We should go back to what was decided by the Synod held in this city in the year 1872 against racist and nationalistic thought in the Church. The echo of this racist and nationalistic thought in Orthodox witness today within the diaspora is no less dangerous in this respect. The second disease is individualism and the interruption of true dialogue between the Orthodox Churches. The interruption of dialogue or limiting it to certain issues, avoiding more sensitive matters, points to the fact that we are unfortunately not ready to accept the other as someone who can question us and our cultural assumptions. It is therefore our duty to listen to others and to seek to hear the best of what others perceive in terms of the beauty and gifts that God has put in all cultures and traditions for the benefit of all. We have to confess that many disagreements could be a source of richness for all, if we look at them with humility and understanding. What does the world expect from us? Your Holiness, you have touched upon much of this in your speeches and especially in the book of dialogues with Olivier Clement. It seems to me that the world is expecting from us prophetic sayings such as those you have uttered on ecological issues and the transfiguration of the earth, on freedom, love, Church, homelands, the societies of consumption and other such challenging issues which characterise the global culture in which we live. I hope we can make the Orthodox Church accept the content of these sayings and live out their meaning. The world is also expecting from us that we seek seriously to re-establish the unity of all Christians, with the non-Chalcedonians first and then with the western Churches. After centuries of disputes and mutual anathemas, of rejecting and neglecting each other, it is time for the weakened community of disunited Christians who wish to incarnate the message of Christ to understand the prayer of Jesus that the world will not believe in Jesus if those who believe in Him are not united. Why don’t we follow seriously the decisions of Balamand and Chambesy for example? We should acknowledge that schism today is not only between the Churches, but also within each of them. While we are called to learn from each other, each of us is searching for Christ in his own way and sings for Him with their own particular words and rituals. We have to love the face of Christ as He is seen by the other. Only then will our experiences complement each other; and we shall discover that the wall of enmity and schism does not grow so high as to reach the heavens. We have to restore the dynamism that prevailed in our openness together in the days of your great predecessor. We need prophetic sayings and prophetic actions that will influence the people of God and restore to them the hope that the unity of Christians can be realised in the near future. God is knocking on our doors saying to us that the days are evil and that we should not stop at formalities. Instead, we should look for the truth in love and understand that if we believe, we can move mountains. We should not forget that true love must be unconditional. Our openness to others should also reach out to non-Christian religions, especially to Islam, whose presence in the world is growing. The historical changes in Antioch made us the “Church of the Arabs”, most of whom are Muslims. We have learned to foster co-existence with them; and many times we have succeeded in opening frank dialogues on the basis of love and mutual respect. We have suffered much in the campaigns of Christians who came to us holding the cross in one hand and the sword in another, increasing our troubles and hardships. Although we denounced the confusion between the Cross and war, we have paid for what has been imposed on us in terms of blood and humiliation. We have, however, preserved firmly, the spirit of the true Cross; and we continue to witness to the contemporary presence of that true Cross. Nowadays, we must continue on this path and witness, despite hardships, as to how our Christ wants us to love everyone. All the Orthodox Church, especially the Churches of the East, have to collaborate in this field. Therefore, we have to think deeply, all of us, about what methods might be effective to consolidate our relations with the Muslims, and to stop the emigration of Christians from our countries. Thus, in the age of big changes in our global culture today, I call upon you, your Holiness, to lead all of us in the process of rethinking the future of the co-existence of religions. We cannot simply leave this to political frameworks, because their interests limit their vision of man on one hand and of the interconnection of societies on the other. We have to find effective ways for us to be the conscience of this political world, so that its limited interests will not continue to be a cause of oppression of the poor and the weak. Besides the different theological dialogues which we must continue to pursue with increased dynamism, we have to join up with other Christians in the service of the poor and the weak and all those who suffer increased violence and persecution all over the world, and in our eastern countries in particular. As my predecessor the late Patriarch Ignatius the Fourth said when he received Pope John Paul the Second in Damascus: “We are called to wipe away the tears of all those who weep.” This process of wiping “away the tears of all those who weep” requires not only prayer, but also support for those in need and sustained work to remove oppression, so that they might be convinced that the last word is not that of death, but of life and love. We have to find the right words and the practical deeds to remind the nations and the wealthy societies of the necessity of working for peace instead of war, working for communion instead of prejudice, and decent living instead of violence and oppression. In this context, I should mention the tragic events raging in my beloved Syria today, just as they raged in Iraq and Lebanon previously, and to say that we bleed with every wound affecting its children in every religion and confession, and to affirm that we have to make every effort to awaken people to the misfortunes of men and the necessity of helping them. Thus, from this revered platform, and on the basis of our concern and common responsibility, I affirm the necessity of solidarity and common work in order to alleviate this suffering with all its humanitarian, sociological, and security implications, this suffering which has hit our countries, so very great in their histories and cultures. Accordingly, I reiterate my appeal to the international society to rise to its responsibilities and to reject every attempt to diminish our cultural plurality and to separate the children of this one people. Instead, let us stabilise and consolidate the rights of everyone in freedom, dignity, sovereignty and common good living. We should not forget that extremism has grown to the extent of targeting both Muslim and Christian clergy, such as in the assassination of the Allama Al Bouty and the kidnapping of the Metropolitans Paul and John.